Using land-based seismic stations, researchers from Yale University found that part of the Nazca Plate weakened and deformed as it bent and slid under the adjoining South American Plate. The Earth’s tectonic plates may be more flexible than previously thought as they slide underneath each other and dive deep below the surface, according to new observations from an international geophysics team. Researchers studying the Nazca Plate, which is located beneath Peru, found that part of the slab weakened and deformed as it bent and slid under the adjoining South American Plate. The data came from land-based seismic stations that show how seismic waves move through structures deep underground. The research appears in the journal Nature Geoscience. The lead author is former Yale graduate student Caroline Eakin, who is now at the University of Southampton. Other authors are Maureen Long of Yale; Lara Wagner of the Carnegie Institution for Science; Alissa Scire, Susan Beck, and George Zandt of the University of Arizona; and Hernando Tavera of the Instituto Geofisico del Perú. 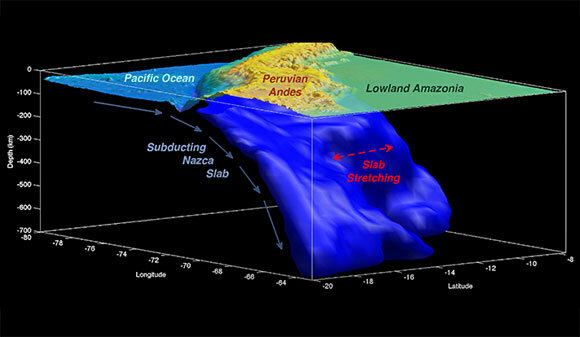 1 Comment on "Yale Researchers Find a Soft Spot in the Nazca Plate"
How is this proof of a sliding ‘plate’? Is it not more like small area’s… localized melting perhaps? Where is there proof of any plate sliding.. Earthquakes are occuring more or less in the same area’s time after time.. how does that support your theory?